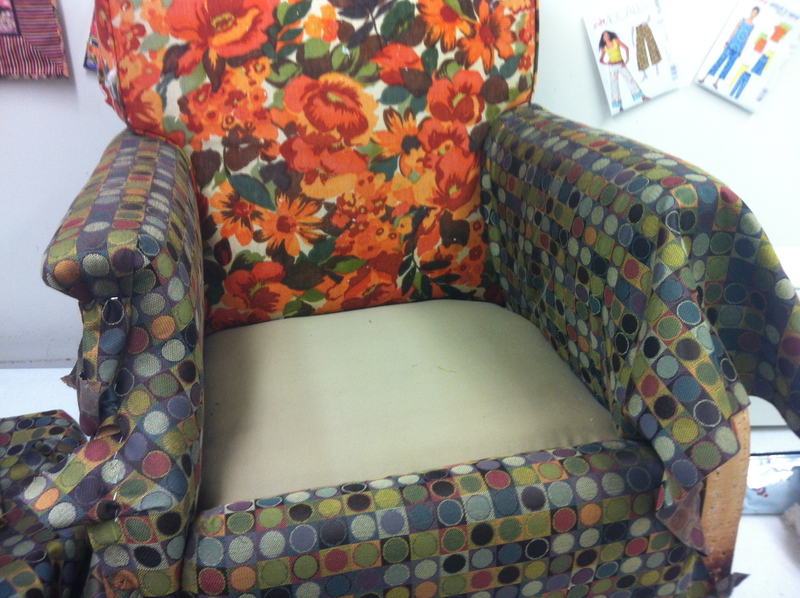 Upholstery class – week #3…..and redecorating! Well not a huge update this week, other than the fact that this was the last class and I DIDN’T FINISH MY CHAIR! I guess it’s not that big of a deal, as a couple ladies in my class were taking it for the second time and one was taking it a third time (although she was working on a pair of channel-backed chairs, which is quite difficult). So even though I hoped to finish it in three weeks, I’ll be signing up for one more round. The first step was to add more batting to the seat bottom. I wanted the seat to sit up higher, and other than just making the cushion fatter, this will help beef it up. Then I had to put new batting on the arm and “reshape” it because of the snack my mom’s dogs had made of it. At that point I was ready to start on the sides. My instructor did some magical calculations about how what size the piece of fabric needed to be. I really don’t understand how he came up with it, probably because too much MATH was involved, but however he did it, it was the right size. 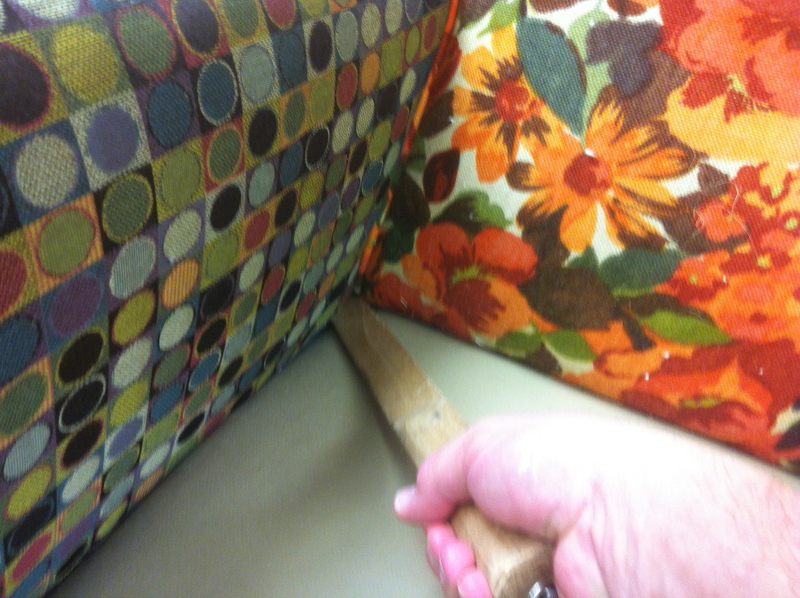 I was given this tool to push the fabric under the arm frame and to the back to attach it. It looked like a long, thick ruler that was kind of beveled, and had the highly technical name of “stuffing stick.” After using it and getting everything tacked down correctly, I managed to get the other side cut out before class was over. 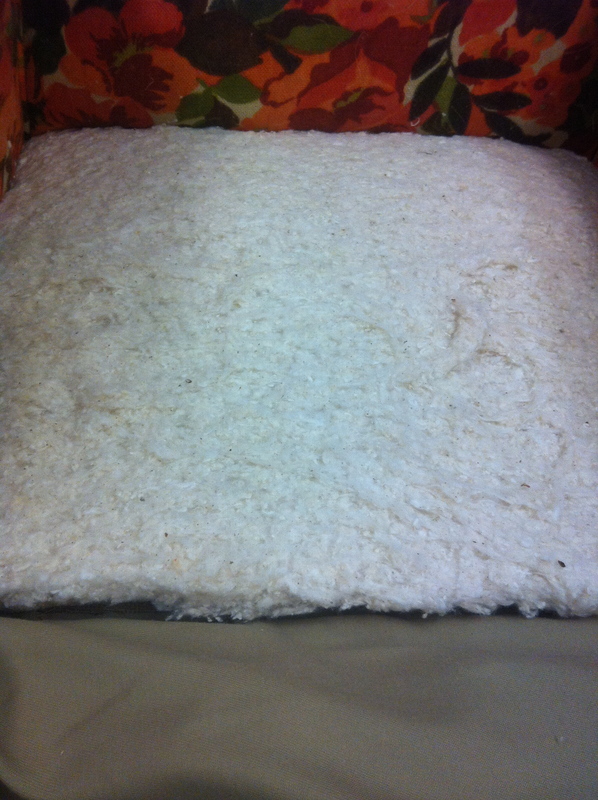 There was a lot of extra stuffing going on for the front panels as well to get things “filled out”. 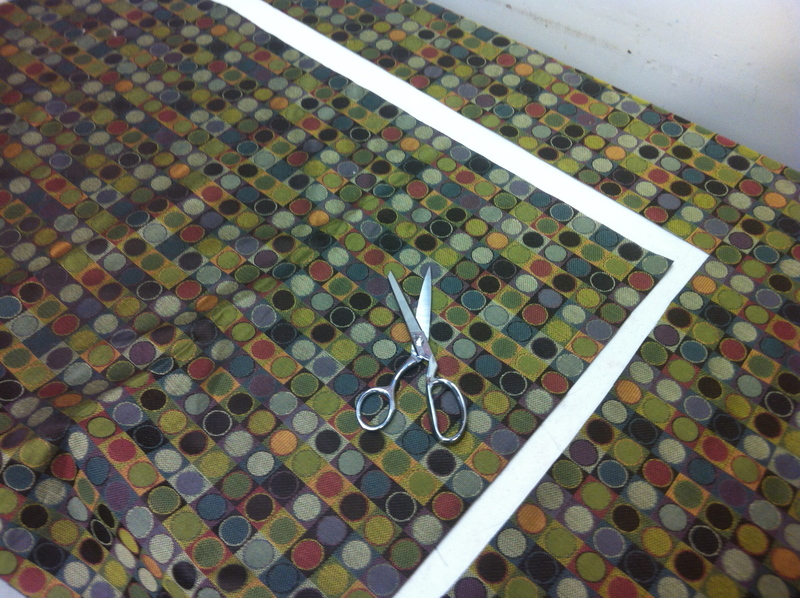 I’m still amazed at how little sewing there is for upholstering – more stretching, tacking and stapling than I’d imagined. But I can see how the chair is going to look now and I’m excited! I started to imagine some needed decor changes at home featuring the new chair, and if I change one thing, then a whole bunch of other stuff will need updating too, right? 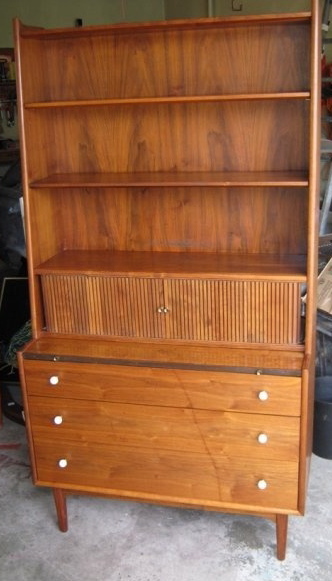 I’m envisioning some new paint in the living room, and I’m working a trade for an amazing 1960s “Declaration” secretary made by Drexel. Designed by Kip Stewart and Stewart MacDougall, the designers looked at creating a a clear modern aesthetic, while relating to Shaker furniture and the Shakers’ desire that the construction details of furniture be visible. This is a brilliant design, because it appeals to modernists and traditionalists, alike. And, it’s frickin’ FANTASTIC! If you are into mid-century furniture and/or design at all, you’ve gotta check out my favorite new website, retro renovation. Of course I will have to have a chair to sit on when I use the desk part, so I bought another chair to work on! 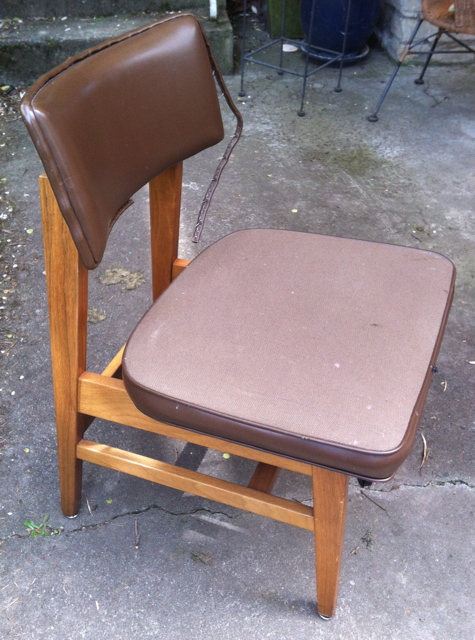 I couldn’t pass it up – a beautiful mid-century Gunlocke arm/desk chair I snagged for only $5 on craigslist. It’s going to look great with the new secretary, and it should be an easier project to tackle (famous last words) as it only needs a small back and seat, and I know I can find some great coordinating fabric to go with my armchair. And I’ve got a great ’50s rattan chair that needs a little work, then I’ll need to tackle the beatiful Danish Modern sofa that’s been languishing in the garage the last three years (it was FREE – I HAD to get it! 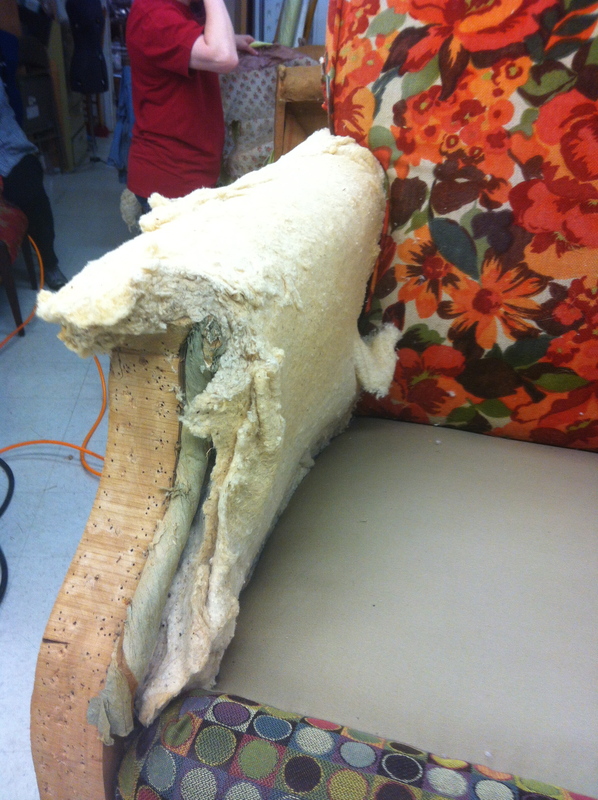 ), but maybe that’s a project for a real upholsterer….. This blog is just a little insight into the tangential way my mind works – from sock monkeys to crafts to furniture reupholstery then redecorating the house, I suppose it’s really not that big a surprise that I have so many unfinished projects and millions of ideas without the hours needed in a day to finish them. And I haven’t even gotten to COOKING yet! For that, you can check out my other blogs – COOKWITHSCOTT.COM and my blog for the Seattle P.I. newspaper. It gets a bit crazy trying to fit it all in on top of working, doesn’t it? My chair’s gonna look GREAT!